OR INTERESTED IN RECEIVING OUR PRESS RELEASES? 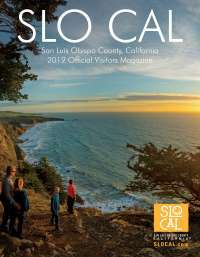 Visit SLO CAL is excited to work with you on your next destination story. To request media kits, photos, video footage, statistics, hotel assistance, itineraries and other services for qualified media personnel, please fill out the contact form below and a member from the Visit SLO CAL team will respond to you accordingly within 24 hours. If this is an urgent matter or a breaking story, please call us at 805.541.8000. If you are requesting a press trip, please note that hosting arrangements are provided through the discretion of Visit SLO CAL member and partner businesses, and are subject to the availability and interest of each organization. Black-out periods exist and may necessitate a press rate, especially for hotel accommodations. Summer is a season when hotels book quickly and far in advance, so please consider visiting SLO CAL during the mid-week or during a shoulder season. Please fill out the media contact form below and tell us more about your requested trip to San Luis Obispo County. Due to high demand, requests for press trip assistance must be received at least six weeks prior to your arrival date. Visit SLO CAL does not guarantee hosted lodging, meals or activities.